When parents send their children off on their own, there is always a list of reminders - what to do what not to do. They try to remind them in the days before they leave, yet, it never fails, that as the child is walking away, the parent is shouting after them wisdom that they had forgotten to say earlier. With only two days left, was this the way Jesus was feeling while preparing the disciples? This day was a day of preparation, although little is recorded of it in the Gospels. On this day, Jesus prepared for what was to come through prayers that were likely similar to the prayers later recorded in the Garden of Gethsemane; strength for Him for what was to come and strength for the disciples. Was the magnitude of what He had to do beginning to weigh on Him? While Jesus was praying, some of his disciples had entered Jerusalem and were making preparations to celebrate the Passover, as per Jesus’ instructions. Jesus and the disciples would celebrate Passover in Jerusalem in the house of a friend. One of the disciples, however, was off preparing by himself, preparing his future. 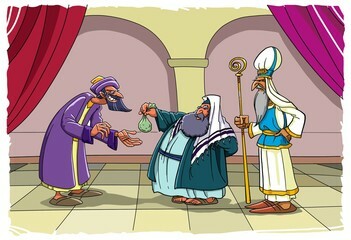 Judas was meeting with the Pharisees and agreeing to betray his friend, Jesus Christ. Judas was given 30 pieces of silver for his betrayal. Jesus knew His death was just two days away. He also knew that He needed strength and fortitude that could only come through prayer in order to face what lay ahead. *The Gospels are not clear if these events happened one day before Passover or early on the day of Passover. The exact days are unimportant in the overall view and meaning of events.